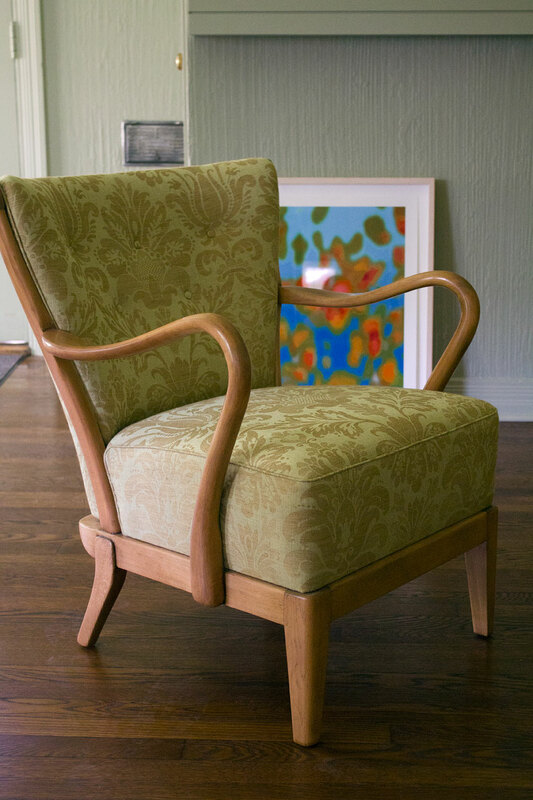 (above) Behind the chair is a piece by Scott Barber called ‘Swell.’ Giclée print on Lysonic paper. First edition, October, 2004, limited to 500. Once it’s hung, I’ll do a full-on proper photograph of it, but I’m waiting for the final coat of paint to be applied on the above wall cabinet before I hang it. A pair of tubby armchairs. That’s how 1stdibs had listed them when I first added them to my portfolio. Before all the restoration work, I had lived with a lot of traditional hand-me-downs and antique mall finds. In other words, my décor suffered greatly from the brown furniture syndrome in an out-of-date arts and crafts style. It was time to grow up in a timeless manner, since I no longer needed trendy objects to disguise a house that desperately needed structural updating. The key words that must apply to any new object chosen for my house are: timeless, integrity, functional, quality, quiet, sophisticated, and gracious. (above) The second chair. Yes, I know. I need to learn how to light a shot. All in good time. These two chairs were my first step in the new direction. The original pink wool tweed had been badly moth eaten and needed to be replaced. Charley McKenney, my designer and architect, selected a french damask from Cowtan and Tout. Here in Dallas, Culp Associates represents this line. We both felt juxtaposing a historical motif such as damask — albeit a contemporary graphic version — with the mid-century modern lines of the chairs would be fun and quirky. And who would be the reupholstery artisan? Julian Vargas is his name, and he has done several pieces for me with more to be worked on in his shop. Some have been completely custom created, and I will be posting about them in the near future in my peekaboo series. This absolutely meets your criteria of timeless, integrity, functional, quality, quiet, sophisticated, and gracious. 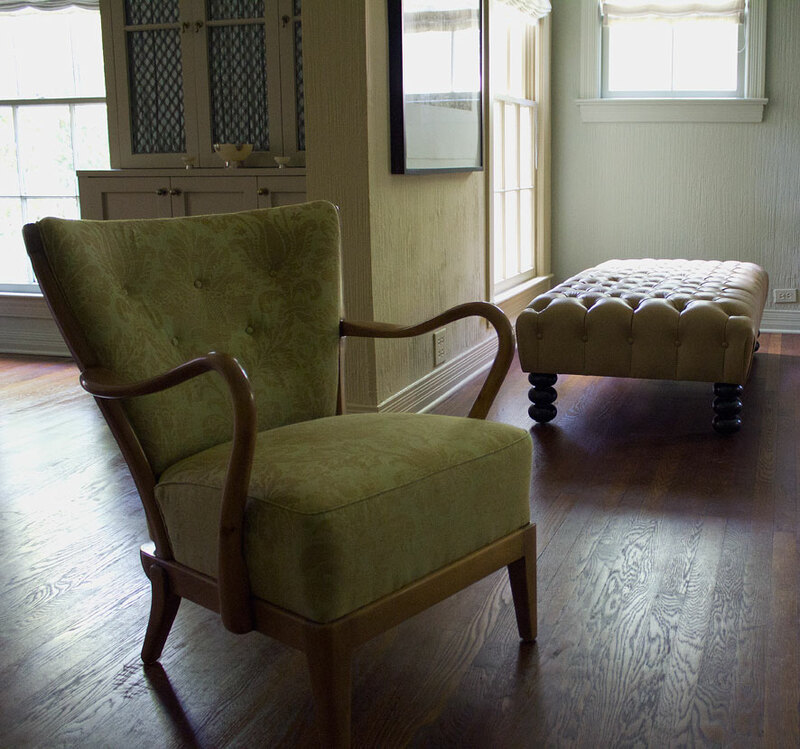 The damask does give the chair a quiet sophistication without being even a bit stuffy. Thank you, Margaret. And thank you for commenting, because this hasn’t been a very popular post. Next post Woops! Forgot to Show This!